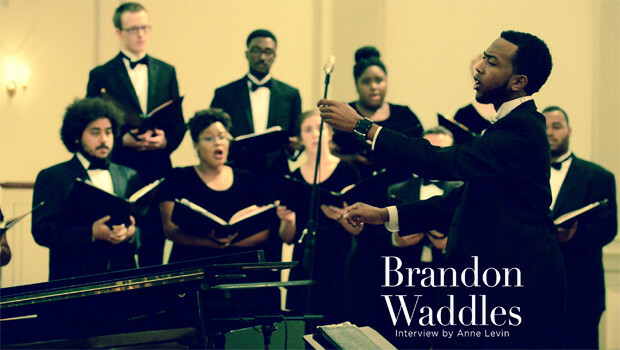 When Brandon Waddles speaks, his deep baritone is an immediate giveaway to what he does for a living. The Detroit native is the interim director of Westminster Choir College’s Jubilee Singers, who specialize in stirring African-American spirituals, hymn arrangements, and gospel songs as well as other forms of vocal music. The 38-member choir will celebrate its 20th anniversary with a special reunion concert on Sunday, April 19 at Princeton Meadow Church and Event Center in West Windsor. Among the expected alumni are Anwar Robinson, who was a finalist on American Idol; Laquita Mitchell, a winner of the Metropolitan Opera Competition and recent performer in the San Francisco Opera’s production of Porgy and Bess; televised on PBS; and the ensemble’s celebrated former conductor J. Donald Dumpson. In its two decades, the “Jubs,” are they are sometimes known, have appeared with the Fisk University Jubilee Singers, after which they were modeled, as well as groups such as Sweet Honey in the Rock, on such stages as Carnegie Hall and Lincoln Center. Waddles has headed the ensemble for the past two years. I graduated from Westminster two years ago. While I was a student I was a member of the choir and also served as accompanist. My father is a pianist and choir director who does everything I do, only ten times better. I grew up with several denominations but attended Baptist church with my grandmother. I also went to Holiness/Pentecostal services. All of that helped to put together what I do now. My grandmother took us to the ballet and the opera, too, and that adds to the mix. I also write and arrange music. What is it about spirituals, gospel, and related music that draws people in? What touches people is the heart and soul behind the music. This is the definitive American music. The spiritual was America’s first true form. There’s a struggle in it that not only speaks to blacks, but to anyone who has experienced life. Some people are wary of singing it because they think it’s the music of slaves. But these songs speak to a variety of expression. Just like Beethoven and Brahms, they speak to the human condition. It’s something very different from the western tradition. Great conductors like John Finley Williamson and Joseph Flummerfelt were building a huge legacy at Westminster of choral classics. So for something like Jubilee to come out of that was amazing. It was really a battle, in some ways, to get that music out. This particular music was not always thought of as legitimate. It was thought to be debilitating to the voice. Are most members of the choir African-American? No. The majority is not, actually. We have Caucasians, Asians, Latinos, and blacks. These are students who are passionate about choral music. I’m spoiled at Westminster, because of the tremendous passion and clarity the students bring to what they perform. To see and hear that in action is truly amazing. They bring their own intricacies to the music. One student in the choir told me that for her, it’s her greatest release. It’s a breath of fresh air. What do you see as the purpose of Jubilee Singers? One big goal is to revitalize the spiritual and make it accessible to the world at large. The other is to bring a greater aspect of diversity to Westminster. The school has evolved in such a fresh way in recent years, and this is part of that. We also want to make choral artistry a more family-oriented and passionate thing. I’m a great fan of choral music, but it seems a little rigid. Westminster serves the family atmosphere of making music, and the Jubs enhance that. Kids love it. How will the reunion concert celebrate the choir? The first half will be the current choir, and the second half will bring in the alumni. Mr. Dumpson will be there to conduct and the alums will do their hallmark pieces. The full band from the First Baptist Church of Lincoln Gardens in Somerset, where I’m on the music ministry staff, will be part of it, too. We want people to have a great time. As I told the audience at our last concert, these seats don’t have glue on’em!